The National Export Strategy (NES) has started sailing on high waves after obtaining Cabinet approval and being launched together with all NES stakeholders. The NES, a flagship development project spearheaded by the Ministry of Development Strategies and International Trade and the Sri Lanka Export Development Board (EDB) together in a public-private partnership, commenced its implementation. The navigator, the State Minister for International Trade Sujeewa Senasinghe, and the core team comprising senior public and private sector representatives who were leading the design and formulation of NES, gathered at the Ministry of Development Strategies and International Trade to track and plan the future implementation of NES. 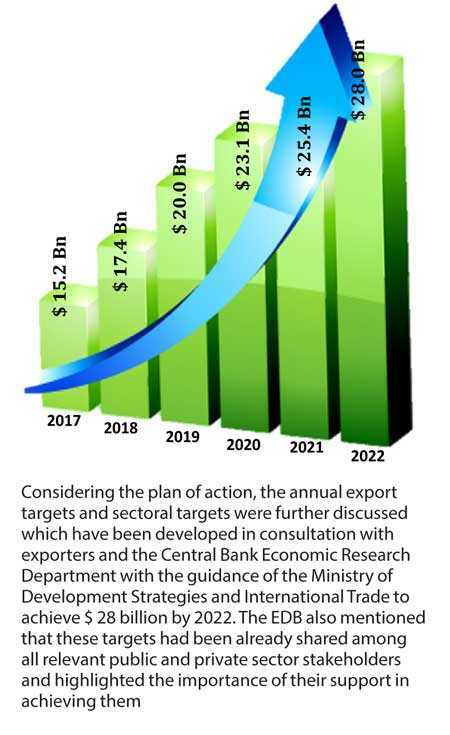 Some quick wins, which could thrive in exports and grow at the targeted rates, were extracted from the NES plan of action in consultation with advisory committees and are currently being implemented through the Budget proposals. These include the Export Market Access Support Scheme and the establishment of the ICT Initiative. In addition, the electronic industry is working closely with EDB and the BOI to attract new investors that are already established in the global network to be engaged with local partners through joint ventures with Sri Lankan electronic exporters and manufacturers. Furthermore, EDB together with the ministry, BOI and other relevant government institutions and industry is heavily occupied with establishing a dedicated industry zone for boatbuilding, establishing infrastructure facilities for the boatbuilding industry in the Koggala Industrial Zone and Weligama and developing a regulatory framework for the boatbuilding industry. In addition, the establishment of a trade promotion platform is also being finalised. The advisory committees have already commenced implementing the identified focused actions under each sector. These advisory committees actively facilitate the implementation of the NES by closely monitoring the Plan of Action of the Sector Strategies. The NES Management Unit was established to lead the coordination, follow-up and monitoring of the NES, and to work closely with the relevant ministries, national agencies, industry associations, private sector organisations and development partners in enabling the smooth sailing of NES’ implementation. The new Budget proposals to be submitted for the National Budget 2019 were identified and extracted from NES. Hence, these new proposals mainly focused on much-needed safety and standards for the processed food sector i.e. upgrading the Food Safety Law and establishing a Control Mechanism (Food Safety and Standard Authority), development of the logistics sector and development of the Sri Lanka Wellness Tourism sector. EDB also presented its Action Plan for 2019 which includes, in addition to NES-focused sectors, the National Quality Infrastructure, Trade Information and Promotion, Logistics sectors along with the other mature sectors of Apparel, Tea, Rubber, Coconut, Gems and Jewellery, etc. The State Minister for International Trade instructed the EDB to create awareness over NES among all stakeholders, especially among government officials. As an initiative, EDB got an opportunity to deliver a presentation on NES at a seminar organised by the Ministry of National Policies and Economic Affairs which was chaired by Prime Minister Ranil Wickremesinghe, with the secretaries of all ministries. The NES document is hailed by think tanks as a bold, far-reaching and ambitious one. The stakeholders involved in the NES are confident that the targets are achievable as the formulation was done on a solid footing at a time the country has recorded an all-time high export turnover of $ 15.2 billion in 2017 (merchandise and services). The NES focus sectors provide a good mix of industries with different growth trends, yet ensures the NES remains focused on achieving the key objective of export diversification during its five-year implementation period. These focus sectors were identified based on quantitative and qualitative parameters derived from export potential assessments since the existing structure of the export of goods and services is already saturated. Hence it is a dream which can be achieved by the dedication and support of each and every institution to reach high economic growth through exports. The selection of focus sectors was also discussed and the views expressed by some of the stakeholders are listed below. Wellness Tourism is not narrowing down the tourism sector but adds more value to the general tourism industry. The Wellness Tourism (Health and Wellness Service) sector attracts wealthy foreigners from high-spending markets such as the UK, Germany, Austria, Switzerland, GCC, etc. while general tourism receives more backpackers. The minimum stay of a medical traveller is one week including for Ayurveda treatment which sometimes goes beyond three weeks depending on their illness as they are purposely visiting knowing the value of this service. As a country with highly skilled medical professionals in both the indigenous and western medical sector, the country could easily be on par with other medical tourism destinations if we could address policy and regulatory reforms. The Electrical and Electronic Components (EEC) sector as a visionary sector for growth and development for the next five years has seen steady growth in Asia. This will lead Sri Lanka towards its aspirations of becoming a hub of growth and innovation in the Asian region, and thereby providing employment and prosperity to millions of Sri Lankans. Globally, the electronics industry has grown from $ 1.75 trillion in 2008 to $ 2.1 trillion in 2016. It is estimated to grow further to $ 2.4 trillion by 2020. Despite the significant growth of the sector internationally, Sri Lanka has had limited participation in the sector so far. The NES will take into account Sri Lanka’s skilled labour, infrastructure and preferential access to key destination markets (such as GSP+) to further develop its EEC industry. The recommendations of the NES are the combined efforts of public and private sector stakeholders to optimise strength, overcome constraints and move towards establishing the Sri Lankan Electrical and Electronic Component sector as an integral manufacturing and trading hub of the Asian region. The essential strategy is also to produce only selected components and join the global production networks since this strategy was followed by countries in East Asia such as Malaysia, Thailand and the Philippines when they penetrated the global high-tech markets. The strategy identifies the three main approaches to making the EEC sector successful in the next five years. These are to leverage the existing capacity of being an electronic manufacturing services centre, become a component manufacturing base for large multinational brands and to leverage innovative ideas available in academia and the industry. The NES prioritises the food industry in the context of the very formidable social and economic opportunity that Sri Lanka has for the transformation of this sector. A lack of innovation and value addition and inadequate branding are all constraints that plague the sector which are addressed in a systematic manner in the NES. The National Quality Council and National Food Authority are two core elements of the NES in relation to food and their purpose is significantly to create an enabling environment for small and medium enterprises to understand and adapt to the requirements for branding, value addition and export of Sri Lankan produce. There are perceived disadvantages linked to weak productivity in Sri Lanka which the NES frames within the potential for the same factors to become clear advantages on account of changing consumer preferences. Food safety fears and social and lifestyle factors have created a situation where small-scale, artisanal produce is valued over its large, commodity-scale equivalent, especially where there are wellness benefits. The evolving characteristics of the international market and associated opportunities make the prioritisation of the Sri Lankan food and beverage processing sector an important element in the NES.